Melt the butter and chocolate together over a double-boiler, or microwave for a short time. Stir to combine. Whisk together the eggs and sugar until the mixture is light yellow in color, and the sugar is dissolved. About 3 minutes. Stir the warm chocolate mixture into the egg mixture and whisk until combined. Sift in the flour, cocoa, and salt. Fold in with a spatula until combined. Spoon into 4 buttered 5-oz ramekins, and tap on the table to settle any air bubbles. Refrigerate for 30 minutes. Preheat oven to 425 degrees F. Place ramekins in a baking dish and add water until it is halfway up the sides. Bake for 15 minutes. Dust with powdered sugar and serve warm. 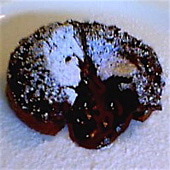 The foods can be turn out, or served in the ramekins. Recipe formatted with the Cook'n Recipe Program from DVO Enterprises. Who Cut Down The Cherry Tree?